I mentioned last week that non-metallic metals are easier to learn for me on our models because there is very little metal to paint. If I’m painting a belt buckle and it looks wrong it’s a matter of a few seconds to start over and try something new. It takes a little longer for a rifle or a knee pad, but I find these are not too discouraging as well. This week I started on Flash, and Flash has the biggest piece of metal in the game so far - his drone. This has been a good learning piece for me. I had a bunch of disparate advice about NMM floating around in my head form different sources. The combination resulted in a pretty bad start and a total lack of confidence. I ended up with something that didn’t look right but I couldn’t see why. I showed it to Bernie for a second opinion and he pointed out is didn’t look shiny enough. Sure enough, there was not enough contrast. The lackluster drone. It looks OK but it doesn’t really sell the metal look. 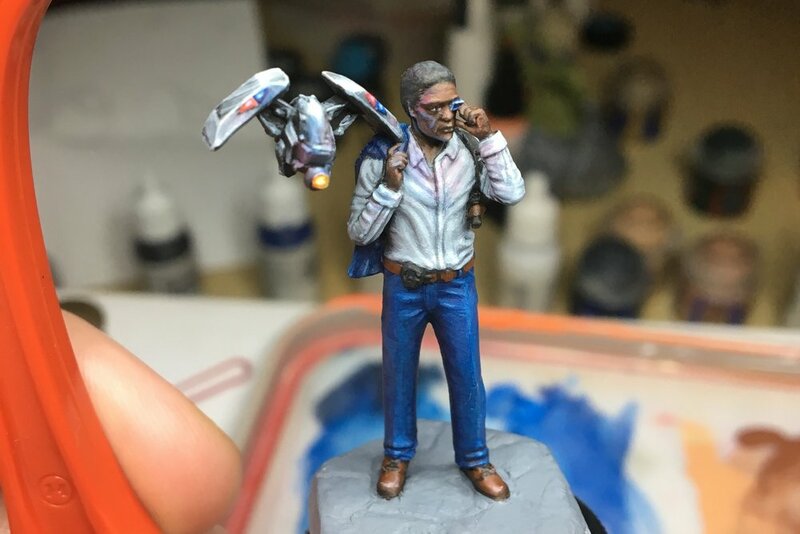 I started from scratch, painting most of the drone dark grey and picking out highlight spots in light grey, sort of like a sketch, just to lay out a plan to create contrast. Then I slowly blended in between the dark and light and added some edge highlights. I pushed the grey back and forth, working one panel at a time. Finally I ended up with something resembling metal! The lesson for me today is to be patient, don’t be afraid to try things. As Bob Dylan said, “When something’s not right it’s wrong”. It’s OK to just start over. Before and after. Hardly perfect but a huge improvement! I’m sure I can, and will, do better in the future. I have a long way to go but I’m happy with this step on my path. It feels like progress. What would you change or improve if this were your model? Stay up to date on our game!